There are quite a few fascinating bromances that have popped up over the years. Barack Obama and Joe Biden. Justin Timberlake and Jimmy Fallon. George Clooney and Brad Pitt. Not to mention, of course, the most iconic duo, Batman and Robin. 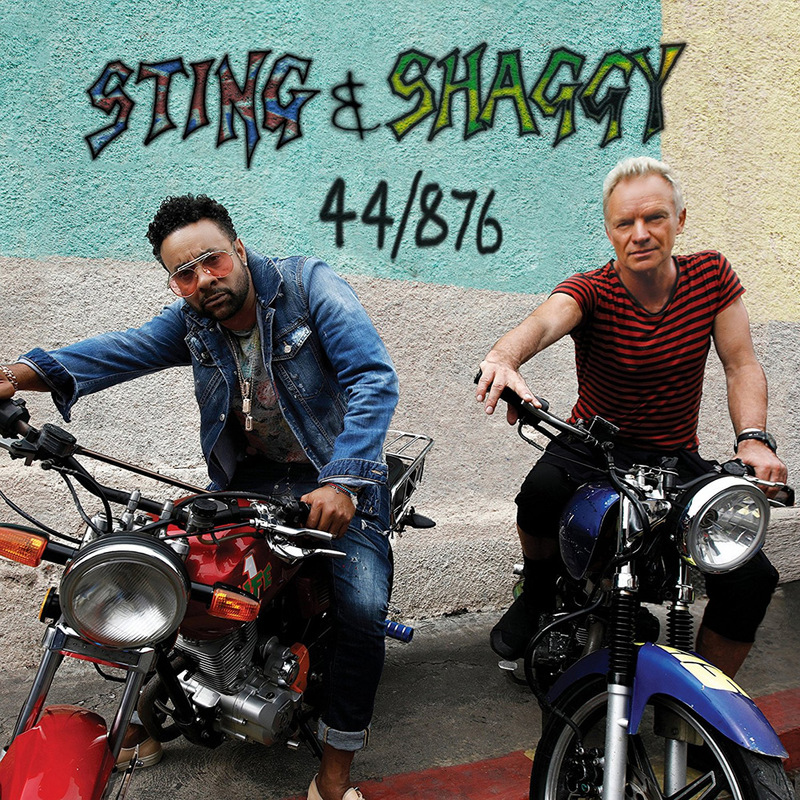 Thankfully we can now add to the list the most surprising new tag team – Sting and Shaggy – who have released their unexpected first collaborative album, “44/876”. While the two joke that they met on Tinder, in reality it was a manager for the two legends who hooked them up for this joint venture. After listening to what would become the lead single, “Don’t Make Me Wait”, the rep sent the song to Sting, who in turn made his way down to the studio in Los Angeles where Shaggy was recording that day. As the story would unfold, without even realizing what was happening, Sting came through the door singing the hook, demanding that Shaggy produce the song with him on it. The rest has all been very kismet for the two Grammy-winning musicians. The synergy has been great. Their vocals complement one another. So they kept recording. Then one song turned into five songs recorded, which turned into the eclectic dancehall-pop album we now know as “44/876”. Of working on the project, Sting reflects that it’s good to be able to share fifty percent of the creative vision as a band leader with Shaggy. On the other hand, Shaggy appreciates Sting’s tendency to push him out of his comfort zone into new territory as a composer and songwriter, especially when it comes to chord changes, key modulation, and the types of song structure that Shaggy isn’t used to. As a result, creating this LP has been a process that both have found exciting and fulfilling. “44/876” as an album gives sunshine vibes and captures the essence of Jamaica more than expected. Their anticipation was to transcend music and culture given Sting’s home island of Great Britain, whose international dialing code is 44, and Shaggy’s Caribbean birthplace whose code is 876. It’s not surprising that Sting would produce such a reggae-influenced album with Shaggy, either. He’s always had an instinct for paying homage to a style of music that shaped who he would become as a musician. This has become a full circle moment in his career by creating this collection of songs with an authentic reggae artist, which has been a natural fit for Sting. In the early days, his band The Police would actually tour with reggae bands like Burning Spear and Steele Pulse when they were first starting out in the late 70s and early 80s. The album’s title track, which features celebrated reggae group Morgan Heritage, is a mix of mystical escapism and feel-good bounce. Several songs really work for the project including “Morning Is Coming” with its classic horn and deep bass vibe and the single “Don’t Make Me Wait”, which is a worthy salute to Bob Marley’s “Waiting In Vain”. “Waiting For The Break Of Day” on the other hand is definitely in the same vein as Shaggy’s “It Wasn’t Me”, with updated chord changes. “Gotta Get Back My Baby” is a bit cliche as if a teeny-bopper would be singing the lyrics, not middle-aged rock and reggae stars. The poet Lewis Carroll served as inspiration for the songwriting on “Just One Lifetime”. In it, Sting pens an adventure between two unlikely people, who, on a journey through life, comment on the dystopian yet hopeful world as they see it, hoping to make a difference. The album boasts strong ballads where Sting takes the lead, like the groovy “22nd Street” and the majestic and beautiful “Love Changes Everything”, one of the strongest songs on the album. “Dreaming In The U.S.A.” is their sincere love letter to the United States, where Sting chooses to live as “a guest”. Though the song isn’t implicitly political and comes across a bit cheeky, Sting is on record acknowledging The Dreamers in America who are in a very necessary fight for rights as immigrants, and this song could be considered a follow-up to “Englishman In New York”. “Crooked Tree” is the most imaginative song on the album with the two acting out a courtroom drama of drug dealing and human trafficking. There are some instant hits as well like the rootsy skank hit “To Love And Be Loved” or the dubstep of “Sad Trombone” and “Night Shift”. In addition to the jams, Sting and Shaggy brought some bona fide heavyweights on board with bassist Robbie Shakespeare of the reggae super-duo Sly And Robbie, Sting’s longtime guitarist Dominic Miller, jazz instrumentalist Branford Marsalis, Agent Sasco, dancehall sensation Aidonia, and other notables. As far as the music game goes, both Sting and Shaggy individually tout a storied career, with their combined sixty-five years in the music business, forty for Sting and twenty-five for Shaggy. That the iconic rock star would saunter into Mr. Boombastic’s recording session and invite himself to create a joint album between the two of them is nothing short of amazing. The two are planning a world tour for summer 2018 that will encompass their epic catalogues of music, and that, in and of itself, is a reason to get on the “44/876” love train!